You may want to do this again next month. 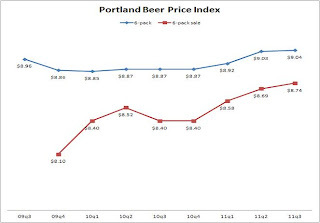 Widmer, Bridgeport, Full Sail and Deschutes all heading up about $1.50 per case at wholesale on 10/3 for 6 and 12 packs. Most higher end bombers will hold for now. Maybe an increase in February? Prices falling on bombers seems to me to be a function of increased competition. And it's a good thing! As always, Bill, I'm so happy you do this. It's a great public service. @priceit: Next month, no. But 3 months from now I'll see the price difference. That's the whole idea, the survey is taken every 3 months. I'm intrigued: what makes you think bomber prices will go up next year? @Jeff: Thanks! I also think bombers have been wrongly priced. 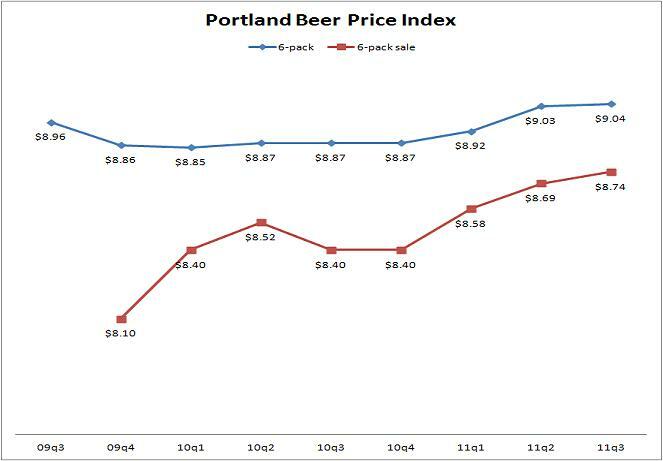 I hope someday in the future to show a graph where the bomber SPE crosses below the six-pack price. In talking with a couple brewers and distributors at least a couple of the bombers you survey are looking to take an increase. The final amount of this increase is still up for debate, in fact, the whole thing could be called off, but I would not be surprised with a 20 cent increase on the higher profile items you survey. Other than Pyramid, there is not alot of increases coming to the bombers for October.